The Saint Mark's, Liberty City branch. 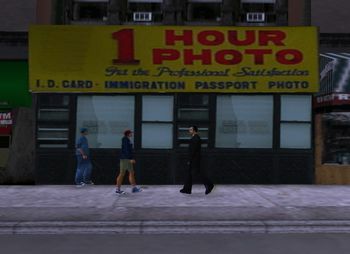 1 Hour Photo is a photo-developing store that appears in Grand Theft Auto III, Grand Theft Auto: Vice City, Grand Theft Auto: San Andreas, Grand Theft Auto: Liberty City Stories and Grand Theft Auto: Vice City Stories. There are stores in Saint Mark's and Fort Staunton, Liberty City, Little Haiti, Downtown and Ocean Beach, Vice City, Rodeo, Glen Park, Commerce and Willowfield, Los Santos and Redsands East, Las Venturas. 1 Hour Photo in Fort Staunton, Liberty City. 1 Hour Photo store in Commerce, Los Santos. 1 Hour Photo in Willowfield, Los Santos. This page was last modified on 11 March 2017, at 14:05.